Faulty capacitors can leak toxic fluid and eventually disable your PC altogether. We investigate, as well as attempting to untangle the thorny world of USB terminology. 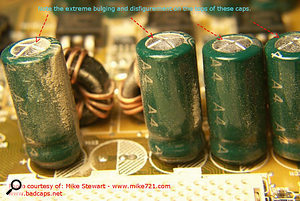 Capacitor 'plague' or 'bad caps' is a problem that can affect computer motherboards, mostly in PCs, but in some Macs too. It has also become apparent in various other mainstream electronic products including televisions, monitors, hi-fis and radios. On a computer motherboard, 'bad caps' problems can start after just six months of use, and can cause a variety of symptoms. An affected machine may need to be switched on several times before it boots up, or reboot before reaching the desktop. Serious cases may result in fans spinning up but no other life from the motherboard, random blue screens, lock-ups, spontaneous reboots that become more frequent, and memory errors. Bad caps problems started to appear around 1999, and the cause is faulty electrolytic capacitors, mainly used in motherboards to smooth out power-supply noise and other interference. The most common variety of electrolytic capacitors is constructed from two conducting aluminium foils, one of which is coated with an insulating oxide layer, and a paper spacer soaked in electrolyte, all rolled into a thin tube and placed in a metal can. Here's an example of the 'bad caps' phenomenon, courtesy of www.badcaps.net, displaying the characteristic bulging tops that eventually cause havoc on some PC motherboards. The problems are alleged to be a consequence of inept industrial espionage, which saw some companies steal an incomplete formula for the electrolyte from a competitor. Because of this, millions of flawed capacitors made their way onto the market with an electrolyte that dries up prematurely, resulting in the production of hydogen gas, huge changes in capacitor value, short circuits, and even spectacular bangs! If your computer's misbehaviour suggests you might be suffering from bad caps, there are various visual signs to watch out for. The most obvious is when the tops of their aluminium cases are bulging (see photograph), or the capacitor is pushed from its vertical position into a slanted pose as electrolyte is forced out of the bottom of the tube. Sometimes this is more obvious when the dried-out electrolyte, a rust-coloured substance, vents from the top, or leaks onto the motherboard from the bottom of the cap. Never ignore such signs, because many other expensive PC components can be destroyed if the capacitors eventually fail or blow apart. No single make or model of motherboard is necessarily immune or more likely to be affected than another. If you spot any of these signs, you have various options. You can try to get a replacement board, under warranty if it's still applicable. Alternatively, it may be possible to replace the affected capacitors yourself, if you're a dab hand with the soldering iron, or get a specialist to do it for you. There's even a web site dedicated to identifying the evidence and symptoms caused by bad capacitors, at www.badcaps.net, which also provides DIY repair solutions and FAQs. The company behind the site now also offer a motherboard repair service for users around the world. You can choose the Standard Repair Service (turnaround 10 to 15 days) or the four-day Express service, with prices starting from just $45 (£22). Beta versions of the first Service Pack for Microsoft's Vista operating system are now in circulation among testers, with the official release slated for the first quarter of 2008. As well as the expected clutch of bug-fixes and security and reliability tweaks, it will add various performance improvements, including enhanced file copying/extraction, better performance of the hibernation/resume functions, reduced CPU utilisation of Internet Explorer 7 and support for DirectX 10.1. It's only around 50MB, making it an easy download, but it's still too early to say whether Vista SP1 will demonstrate any improvement in audio performance, to bring it back into line with Windows XP. There's still lots of confusion among PC users concerning USB peripherals. The USB Implementers Forum (www.usb.org), a non-profit corporation founded by the group of companies that developed the Universal Serial Bus specification, are keen that manufacturers use consistent USB product packaging, marketing and advertising, but things seem anything but consistent at present. There are currently three different USB data-transfer rates: 1.5 Megabits per second, 12Mbps and 480Mbps. The first two are widely referred to as 'USB 1.1', but are described in the USB 2.0 specification as 'low' and 'full' speeds respectively. Officially, they should simply be termed 'USB' by manufacturers, with the Basic-Speed logo used in promotional material. The newer 480Mbps rate, which is only available from USB 2.0, is termed Hi-speed USB. Products that require this higher bandwidth should carry a USB logo with a red Hi-Speed flash. Confused about the true speed of your USB peripherals? True Hi-speed devices requiring more than the 12 Megabits-per-second data-transfer rate should display the red flash, while those happy with less bandwidth will display the simpler blue logo.Understandably, there's lots of confusion among users as to whether 'full-speed' or 'Hi-Speed' USB devices are the faster, and in practice, you'll find USB devices requiring up to a 12Mbps bandwidth variously labelled as USB 1.1, USB 2.0, USB 2.0 full speed, or simply USB (the 'correct' term), and manufacturers muddy the waters further by using ambiguous phrases such as 'high-speed USB 2.0', 'USB 2.0 full-speed compatible' and so on. Even the USB Implementers Forum themselves add to the confusion by mentioning additional terms such as 'Basic-Speed' and 'Original USB'! The bottom line is that any device labelled 'USB 1.1' (or, as is more correct nowadays, plain 'USB') will work perfectly when plugged into a USB 2.0 port. The lowest data-transfer rate is mostly used for computer keyboards and mice, while the 12Mbps bandwidth is perfectly adequate for a stereo interface running at the most common 24-bit/44.1kHz and 24-bit/48kHz formats; it only struggles for bandwidth if you want to record and play back simultaneously at 96kHz. If it fits your requirements, USB 1.1 is fine, and there are now lots of USB 1.1 audio interfaces to choose from at really low prices. Likewise, few MIDI interfaces and controllers require the greater bandwidth of Hi-speed USB. Most Hi-speed USB devices requiring up to 480Mbps should also work in some fashion if plugged into USB 1.1 ports, although since the available bandwidth is 40 times less, they will be severely restricted. For instance, multi-channel audio interfaces will probably be capable only of stereo operation at up to 48kHz. However, note that the 480 Megabits per second rate is the maximum bandwidth available to USB 2.0 products, and few audio devices make full use of this bandwidth. Well, USB 3.0 is on its way, although apparently we won't see USB 3.0 products being released until 2009, or even 2010. The new standard will, however, feature optical connectors alongside the existing wire-based ones. These are claimed to increase existing data-transfer rates by more than 10 times, as well as offering greater energy efficiency. USB 3.0 will also be backwards-compatible, so that you will still be able to plug in existing USB 2.0 devices. External hard drives and video devices will no doubt benefit from these greater speeds, but most other USB peripherals are already perfectly happy with the 480 Megabits-per-second transfer rate of USB 2.0, so I doubt that this new standard will result in many new audio interfaces being designed.